Make sure the vitamin D supplement you take passed our test and is right for you! Choosing the best vitamin D supplement, and knowing when to use it, can be difficult. ConsumerLab.com's staff removes the guess work by showing you which vitamin D supplements are of highest quality and best value based on independent tests of popular supplements, as well as summarizing the latest clinical studies showing how vitamin D can and cannot help. Vitamin D plays a critical role in bone health, and adequate vitamin D levels in the blood are associated with reduced risk of heart attack, high blood pressure, depression, rheumatoid arthritis, asthma, allergy, and even colds. Adequate vitamin D has also been shown to strengthen muscles, improve sleep, and reduce the risk of falls, while too much vitamin D can have the opposite effects. 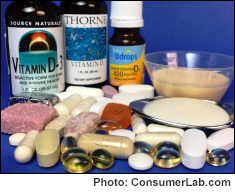 You must choose and use vitamin D supplements carefully if you want the best for you and your family. Our tests found many quality supplements providing 400 IU to 5,000 IU of vitamin D, but also products which may not break apart properly to release their ingredients or contain less ingredient than listed on the label -- including other ingredients for bone health such as calcium, vitamin K, and magnesium. You must be a ConsumerLab.com member to get the full test results for vitamin D supplements, including quality ratings and CL's Top Picks. You'll also get vitamin D cost and ingredient comparisons to help you find the right product at the best price -- some costing only 1 cent per day. You will get results for 44 vitamin D supplements: 24 selected for testing by ConsumerLab.com and 20 additional products that passed the same tests through CL's voluntary Quality Certification Program, as well as information about three supplements similar to ones that passed testing. What is vitamin D, and is vitamin D2 or D3 best for you?